Come to a CCAP Town Hall to talk about the growing number of “zones of exclusion” in the Downtown Eastside and about what makes a store or a service low-income friendly. CCAP will try to collect your thoughts, identify and map all the low income stores (existing and lost) and make recommendations to the city about how to stop gentrification and save the existing shops that cater to the low-income community. To make it a bit more fun, we will also be voting on which retail stores are the most affordable and friendly if you are low-income! The townhall will be translated into Cantonese. As wealthier people move into the neighborhood, more spaces are devoted to offering amenities that cater to them. Grocery stores, banks, coffee shops, restaurants, salons, various retail stores, night clubs, stylish pubs, etc. begin to appear throughout the neighborhood, and are priced beyond what people on fixed low income can afford. These sites become zones of exclusion. At the same time, retail that caters to the low-income community are priced out, upscaled or closed down. 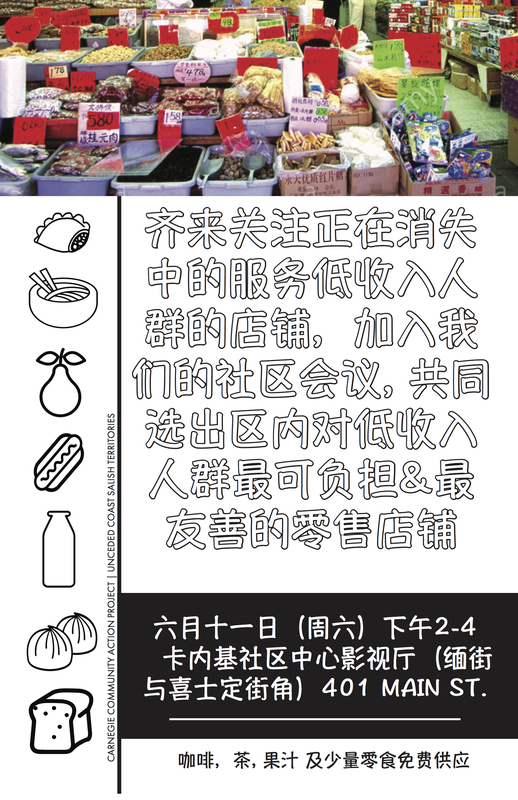 Survival street vendors are harassed, criminalized and pushed out of the neighbourhood. As gentrification destroys low-income spaces and produces more and more zones of exclusion, low-income residents become alienated from their own community. It is the experience of internal displacement – the feeling of being out of place in one’s own neighborhood. The town hall will be taking place on the unceded coast salish territories of the xʷməθkʷəy̓əm (Musqueam), Səl̓ílwətaʔ/Selilwitulh (Tsleil-Wauthuth) and Skwxwú7mesh Úxwumixw (Squamish) peoples.